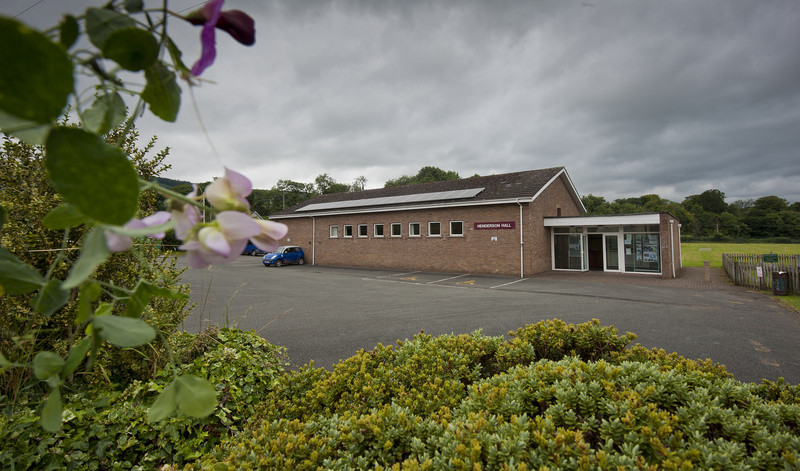 Henderson Hall is a community hall which is available for hire for all sort of events; parties, training, presentations, sports fixtures, overnight stays, cinema evenings. It is right in the centre of the village with a large hall that has a brand new entrance lobby with ladies, gents and disabled toilet facilities. The main hall can accommodate 160 people theatre style, 120 served at round tables, 140 people seated for a buffet. There are two spacious 2 changing rooms with showers, a large stage, WiFi, AV equipment with induction loop, a brand new kitchen with commercial oven and dishwasher suitable for large events, a small meeting room, parking (with a token operated fast charger for electric cars) and a large playing field at the back. There is now an exciting Bike Hub at the side of the hall with a bike wash, brand new public toilets and showers and a sheltered seating area for anyone spectating events on the playing field. The new kitchen is large and equipped for large scale catering so ideal for a big party or event. A commercial oven, two fridges, freezer, plumbed in urn, commercial dishwasher, microwave oven are all there. Cutting our carbon footprint is really important to us so if you are looking for a venue that ticks the ‘green’ box then we are it! We have two rows of PV panels which help us run our air source heating, keeping the hall nice and toasty. Our lighting has been changed to energy efficient bulbs and the water used in the external toilets and bike wash is rain harvested.